The Prime Minister, Peter O’Neill has questioned the logic of the Opposition Leader’s ongoing attempts to claim the spotlight on national infrastructure projects to which he has dubious connection. PM O’Neill made the comments after the Opposition Leaders’ most recent bizarre outburst where he claimed credit for infrastructure projects while also condemning them as a waste of money. “Polye is living in the past and trying to claim credit for projects where his involvement was questionable or counterproductive,” the Prime Minister said. “In the past four years our Government has been rebuilding the nation’s infrastructure through new projects and restarting other initiatives that had been struggling under the previous Government. “The infrastructure for the Pacific Games is a good example of the previous Government not having the capacity to deliver. “New airports and wharves and highways have been delivered because this government has managed these projects, funded them and then delivered. 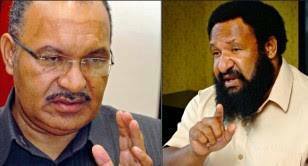 PM O’Neill said the Opposition Leader needs to look at his own record and put his ego aside.“Polye is one of the longest serving ministers in the history of the country with the least to show. “For nine years he was Deputy Prime Minister and senior minister responsible for works in the Somare Government. “During this time the Government received record levels of revenue from high commodity prices and they simply wasted this money. His record speaks for itself. "Where are the projects that he has seen through from concept to delivery? "There is not a classroom, not an airport, not a road, not a serious project that he can honestly say he initiated and delivered. "I know he wants to have a road or a building named after himself, and if he makes a strong argument this will be considered by relevant agencies. "But this ‘look at me’ attitude has nothing to do with building the nation but is all just desperate politics. "Governing our nation is not about ego, it is about working hard to deliver for our people. So enough loud-mouthing from the Opposition Leader.